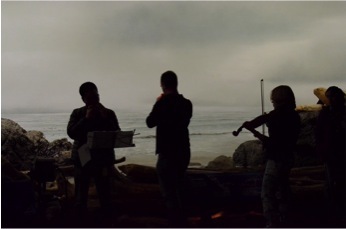 Music for Natural History, a performance installation by Paul Walde and Tina Pearson for the Natural History Gallery of the Royal BC Musuem, officially launched on Saturday October 17, 2015 with a Natural History Soundwalk workshop at the Museum. The event introduced the project, its artists and its themes and took participants on a listening soundwalk inside the Coastal Forest diorama and Beacon Hill Park. Photos of the soundwalk by Lyssa Pearson. “The workshop allowed us to tune in to the unexpected interconnections between landscape, identity, and technology,” says Kim Gough, Royal BC Museum’s Adult Learning Team Lead. Why Music for Natural History? In ancient times, the human capacity for listening was highly developed. The local biosphere was teeming with the rich sounds of millions of creatures sensing and interacting with each other, with the plants and trees in the environment and with the shifting sonic patterns of wind, rain, snow and heat. Our ancestral responses were deeply woven into this dynamic soundscape. Today, the Earth’s biosphere is radically different than it was even a hundred years ago: The human population has more than doubled since the 1960’s and there are less than half as many wild animals globally as there were in 1970. The sound of the biosphere is dominated more and more by the constant presence human sounds – motors, electricity, loudspeakers; the buzz of people talking, building and moving – while the sounds of birds, insects, mammals, fish and plant life changes and diminishes. This reversal, in turn, has altered how most humans listen to and interact sonically with their environments. Victoria sound artists Tina Pearson and Paul Walde are part of a growing global movement of artists whose work fosters re-connections to the biosphere and invites renewed and new relationships and dialogues within it. Working in partnership with Victoria’s Royal BC Museum, Pearson and Walde created a unique sound performance for the Museum’s Natural History Gallery. Music for Natural History gives voice to the taxidermied birds and mammals, man-made plants, trees and painted landscapes representing the biomes native to Western Canada displayed within the Gallery’s Coastal Forest and Seashore dioramas. Two naturalistic compositions critically engaged with the museological display, while inviting performers and audiences an entry to long forgotten ways of listening and sounding. The performance took place within the Royal BC Museum’s Natural History Gallery on January 15 and 16, 2016 and featured local musicians and community members using conventional and invented instruments, objects and voices in unusual ways with no prerecorded or electronic sounds. More info here. When was the last time you really listened to the sounds all around you and heard the complexities and richness of the soundscape of nature, the city or the museum? Join Tina Pearson and Paul Walde for an afternoon of sound exploration. If you are interested in using sound to become more intimately aware of your environment then this soundwalk is for you. The workshop will involve time in the Natural History gallery at the Royal BC Museum as well as a soundwalk in Beacon Hill Park. Come prepared to be outside. Have you ever called back to a crow or tried to sing the tones of a burbling brook? Tina Pearson and Paul Walde have been working with local musicians to learn to replicate these and other sounds of the local biosphere. Join them to find out how to experiment with sonic mimicry in your own backyard. The workshop includes sound play with participants and a discussion of themes behind the Music for Natural History Project. No skills or instruments needed, but simple acoustic instruments / sound-makers are welcome. Tina Pearson is a wilderness-bred composer, performer and facilitator whose work plays with sonic phenomena, communications between species, cultures and identities, and the relationships between creators, performers and audiences. Pearson has led soundwalks and worked with soundscapes in urban and wilderness projects since the 1980’s. She recently formed the Biospheric Art Practice group in Victoria. Paul Walde is an intermedia artist, composer, and curator. Walde’s body of work suggests unexpected interconnections between landscape, identity, and technology and includes painting, photography, printmaking, video, installation, and audio. In 2013, Walde completed Requiem for a Glacier, a site-specific sound performance featuring a fifty-five-piece choir and orchestra live on the Farnham Glacier in the Purcell Mountains to international acclaim. LaSaM Music has been producing creatively adventurous music events in Victoria since 2008. LaSaM is known for its original themed projects inspired by relationships between the natural world, sound and music; the provocative ideas of music practitioners who work outside the margins; and the act of listening itself. Previous major projects include Music For Mycologists (2013) Dark Listening (2014), In a Large Open Space (2011), “And Beethoven Heard Nothing” (2010), and Removing the Demon (2009) among others.